There's a lot to appreciate in my neighbourhood: Hampstead Heath, wide tree lined streets, little old cobbled passageways, farmer's markets, the city farm, and not forgetting my veg patch garden- there's a lot going on if you stay local and love nature. Little visuals catch my eye as I walk around and I quickly snap these for posterity. Sometimes I just want to remind myself of a new yoga class starting or the location of some tempting foraging; often I snap a photo on my phone because it's there and I don't have my camera to hand. Quite a few of these get posted up to my Instagram account and make a visual diary of the week that's been so I thought I'd share with a weekly Insta-update. 1. Quince. Not real quince but the fruit of Chaenomeles x superba, also known as Japanese quince. Beautiful red and gold flowers (on this cultivar) in springtime and edible fruit in autumn. These fruits are smaller than real quince (Cydonia) and not so perfumed but still very edible when cooked, sweetened slightly and made into faux Membrillo (a Spanish quince paste), eaten with cooked apples, or sliced with honey and hot water for a refreshing tisane. 2. Pear. This was had fallen from the tree and I discovered it shortly after. Sweet and juicy, it was my first pear from this tree, seven years in the waiting. Most of the other pears have been removed by people walking past the garden. 3. I'm reliably informed this is the fruit of the Strawberry Tree, Arbutus unedo. I've never noticed this before but its bumpy globes caught my eye on a walk around the neighbourhood and I'm thrilled to discover that the fruit is edible - with the bonus that the pip can be grown into a new tree, albeit v-e-r-y s-l-o-w-l-y. 4. Tomatoes. I've had a really bumper crop this year, most of which have stayed resolutely green - 'Sungold' being the exception. Finally, a few others are slowly starting to ripen. These are Maskotka and I've also picked a couple of Petomach tomatoes this week. 5. Nasturtiums. These go completely bonkers in autumn and sprawl over everything. The plus is that the flowers have wonderfully long stems, perfect for picking, and thereby removing a few of the seeds that will inevitably start the whole process again next year. The leaves in the vase are from a small Sambucus nigra shrub I bought last year. 7. Brussels Sprouts tops. Yum. Plus purple and green is such a fab colour combo. Seeing beauty everywhere. 8. Garden gathered. I only popped down to cut some of the carrot seed heads for a recent charity shop vase purchase (seen centre top of photo). I came back with a surprise bunch of crunchy and sweet purple carrots, achocha, the aforementioned pear and tomatoes, raspberries and fennel seedheads. Ker-ching! 9. Sprouts! Yep, I'm pleased to see these are bulking up nicely. I haven't grown sprouts in recent years as they've not been a success before but the recent rain has fed them well and these are on track for (dare I mention it?) Christmas. Posting this a day late ~ sorry ~ as I had a very late journey home after a dash to the Hampshire coast at the weekend. This will be a Monday meme, join in if you wish and let me know! Hope you all had a good weekend and had plenty of sunshine wherever you were! Awesome Garden Gathered Warm Salad - perfect for Autumn Harvests! I made this Warm Carrot, Apple + Crispy Kale salad for my supper last night, tossing just a few freshly picked lettuce leaves from my balcony around the edge for added garden goodness. It took next to no time and - oh my goodness! - was spoon licking good. 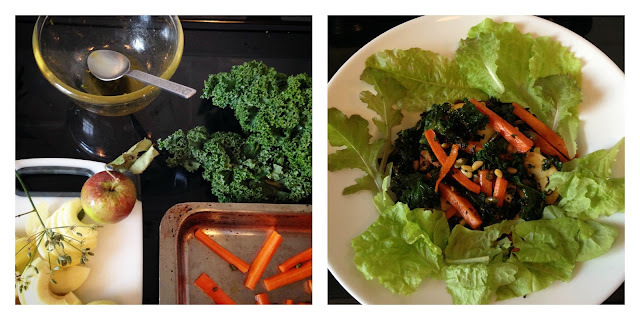 I even scraped the roasting pan, it was that yummy - but I guess you would need to love the taste of aniseed (fennel) and chinese crispy 'seaweed' (roasted kale) to properly love this dish. I switched the ingredients slightly by adding pumpkin seeds and pine nuts instead of the suggested mixed seeds (they were all I had) and I used fresh plump fennel seeds from the garden instead of dried. I also used my whirly apple corer gadget to make rings which I sliced instead of laboriously peeling and making matchsticks out of an apple. (I love a bit of time saving, especially when hungry.) Another suggestion is to spice it up with finely chopped chillies and to serve with a poached egg on top. I think this is one of those dishes that can be chopped and changed, quantities and ingredients, to suit. 1. Preheat oven to 180C, gas 4. Place carrots in a bowl and toss with the rapeseed oil and fennel seeds to coat. Spread them out on a large roasting tin and roast for 5 minutes, then add the mixed seeds (or whatever you're using) and roast for a further 2-3 minutes until toasted and golden. 2. Add the chopped kale leaves (stalks discarded), toss with the carrots and seeds. I drizzled more olive oil over the kale at this stage plus a drizzle of Tamari soy sauce and a grinding of black pepper. Roast for a further 6 minutes until beginning to crisp. 3. Add the sliced apple rings, toss with other ingredients and pop back in the oven for two minutes. 4. Remove from oven, dish up and eat - on it's own, with a salad or as a side for a bigger meal. Interestingly, the original recipe says to add cubes of smoked cheddar cheese and a tablespoon of cider vinegar to the dish before serving. I have to admit I forgot this stage; probably too eager to get munching! 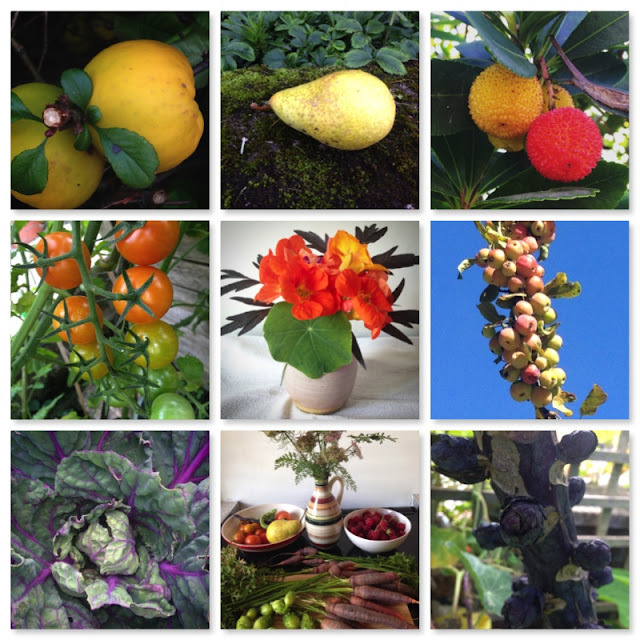 Have you got any go-to favourites for your autumn garden produce? Share, please! Aren't caterpillars supposed to have turned into butterflies by now? A few in my garden seem not to have realised this - or perhaps they're just too busy eating their way through my Cavolo Nero leaves. 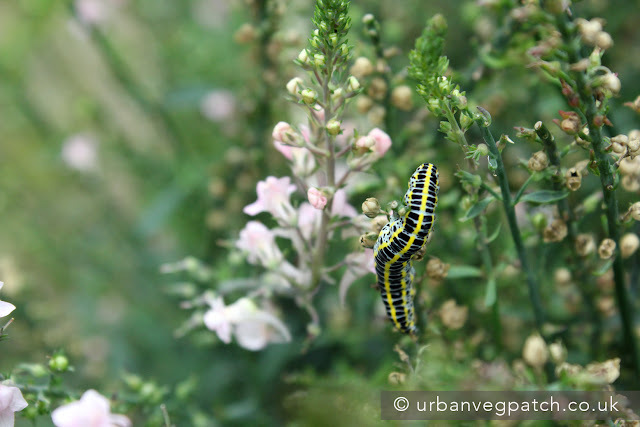 Any that are on the Linaria/toadflax, as in the photo, are allowed to live on. I'm secretly hoping that they're busy munching on the seeds that turn into a gazillion plantlets for me to weed out throughout the year. Anyone else still spotting caterpillars or other anomalies in the garden? I thought my brassicas would be safe by now but perhaps I'm wrong. Please feel free to correct me. There are, undeniably, moments of staggering beauty in the Autumn garden, whether in the way that plants have grown together to form a living collage or the many many webs that spiders have woven between the plants and supports. My veg garden has lain undisturbed, except for torrential rain, for the past week so I was expecting to see plenty of spiders and their webs this morning. 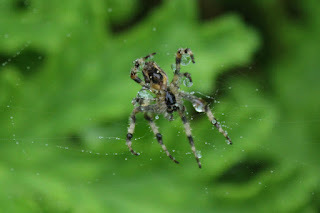 I was reminded of a blog post I'd read recently in which the blogger said she walks into the garden waving her arms in front of her at this time of year for fear of walking through webs. (I apologise as I can't actually remember who it was that wrote that!) I haven't done that yet but I have brushed webs out of my hair and off my face many times during this so-called summer. If there was any dew this morning, it had all gone by 7.30 am when I went down to the garden. Time to put my plan into action. 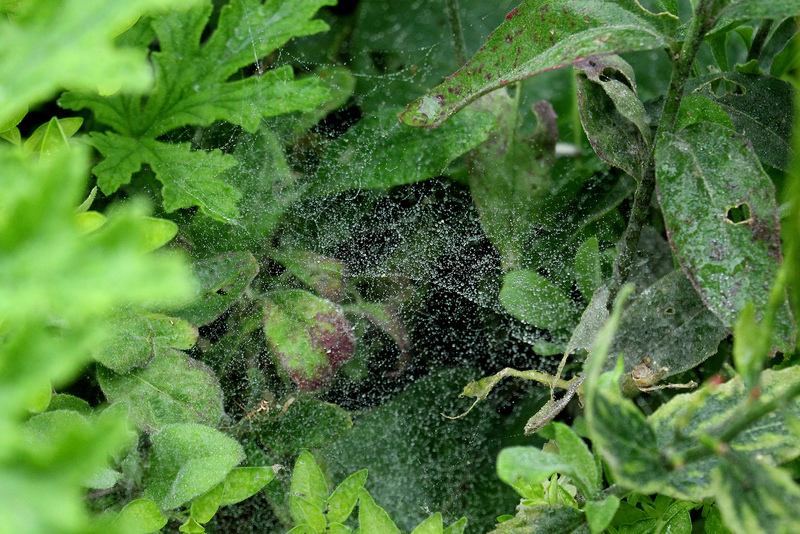 Spray, so I knew where the webs were, and then - why not? - photograph them. I am, of course, just getting my eye in before we get proper dew in the garden but I hope you agree it worked rather well. Plus it's an excellent way to show children how big the webs are, before scurrying back indoors to read Charlotte's Web. Now wouldn't that be something, to find a web with a message in it! 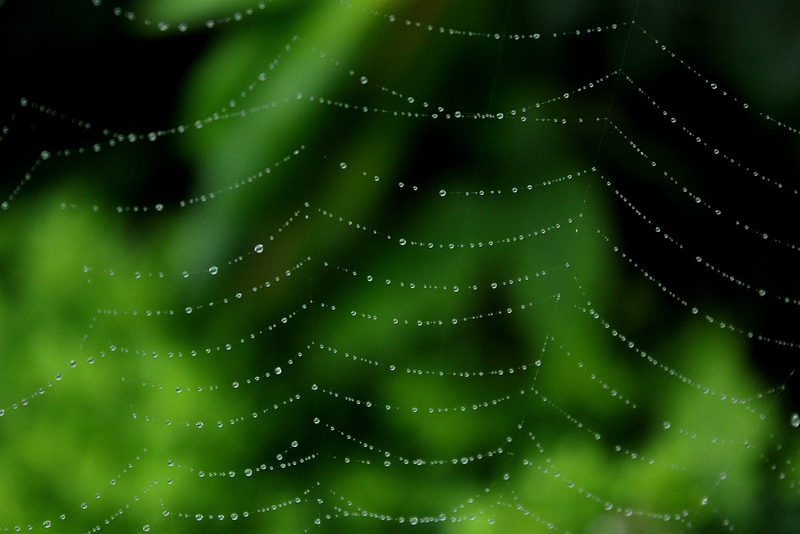 Spray in a light mist across the web. You may need to go back and forth across the strands a few times and you'll be surprised at how far some of the webs stretch! 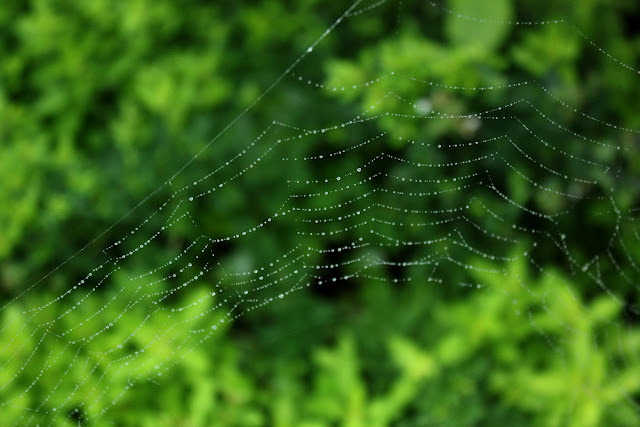 Have your camera ready as spiders may make a bolt for safety. On a still day, dial your camera to aperture/AV (rather than speed/TV) and set the aperture to a low number. This will blur out the background but you will need to have precise focus on the web. Try to have a dark background to make the web stand out. This is best done in early morning or the cool of the evening when there are more spiders about. Edited to add: One last tip - be patient and take your time. It's worth it for the right shot and you'll see a lot more of the delicate beauty in your garden. I do love spiders' webs but how about you? What's catching your eye in the garden this Autumn? And do you have any good tips to share on photographing the garden? Oooh, I do love raspberries, don't you? But, if you're going to go to the bother of growing your own, you'd hope that the end result will be better than (or at least as good as) anything you could buy in the shops, yes? Despite recent heavy rain which has perked up my raspberries no end, I can't help thinking (again) that Autumn Bliss aren't quite hitting the spot for me. Last year I was tempted to rip them out and start again. They take up a fair bit of veg patch space (not as much as summer fruiting canes though) and I want those big fat raspberries that you see in the shops. (Don't we all?) I started looking. I made a start at replacing the canes by buying a few Polka canes early 2014 but couldn't quite bring myself to dig up the old canes until the new ones were established. So I now have a patch of Polkas and a line of Autumn Bliss. Time for a comparison. Polka on the left, Autumn Bliss on the right. 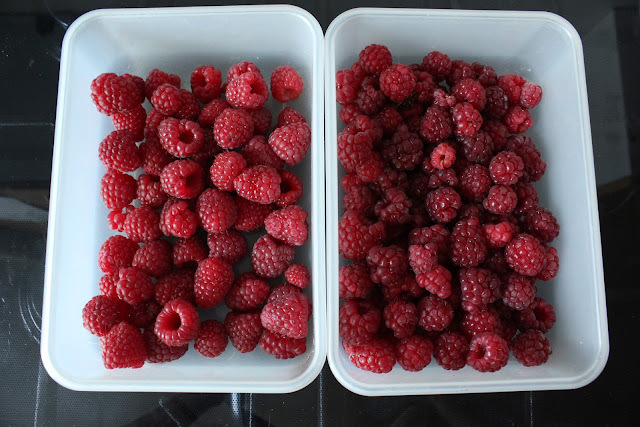 I've been picking a bowlful of raspberries from each patch every couple of days throughout August. I've probably got about 8 Autumn Bliss and 3 Polka canes but the Polka raspberries fill the bowl more quickly, being consistently much larger and firmer than the Bliss berries. Their taste is better too, being slightly sweeter. The Bliss canes, however, usually start fruiting earlier in mid-July. They're cut down in late November, leaving just one or two canes per plant at 40cm. I've pruned like this every year and have found that this is a method that works for getting a small but earlier harvest. The Bliss canes were still fruiting in early December last year while the Polkas had all finished by then. There are other considerations. I find that Polka hold their shape better and for longer on the cane than Autumn Bliss and the latter fruits occasionally have a slightly musty flavour. And why am I finding slug trails on fruit at the top of the Bliss canes? Now that's determination for you. I think my decision is made. Roll on with the replacement programme. I'm also thinking of trying Joan J and perhaps some gold raspberries. What about you? How do you grow yours? Have you got any favourites or have found a variety to be particularly successful? I'd love to know! 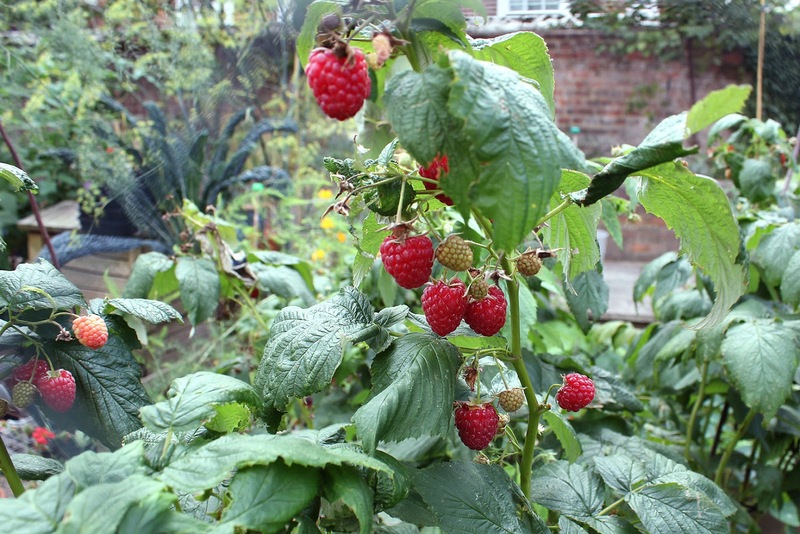 And do you mulch and net your raspberries? More Polka berries on the way ….